Give your bathroom painting project all the attention it needs! 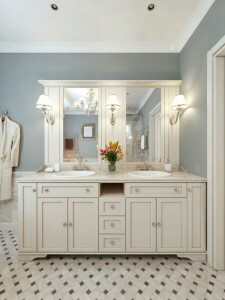 Most painters would agree that bathrooms are especially tricky when to comes to interior painting. There are more aspects that come into play, and therefore more things to keep in mind. With that said, if you have a bathroom painting project on the horizon, here are some things to remember before you pop open the first can of paint. Painting is an art. This statement is true regardless if it’s on a canvas or the walls inside your home. Bathroom painting is one process that simply cannot be rushed. When it comes to interior painting, bathrooms tend to take the longest compared to other rooms in a house. Set aside a day that is dedicated to painting that bathroom of yours. This is a simple step, but extremely necessary. If there are high levels of humidity in your bathroom, it can potentially damage your paint. Make sure you open your windows or turn on the ceiling fan. It will take you all of 30 seconds to do and will help you get those high-quality results you are looking for. The better your painting equipment is, the better results you will have. You want to invest in some higher-end paint supplies such as brushes, rollers, and painters tape. If you are cheap on your supplies, your paint project will suffer. For example, cheap paint rollers are known for splattering and leaving drips. Painters tape is an absolute must when it comes to painting a bathroom. Many bathrooms nowadays have expensive flooring and bathroom sink countertops. It would be a shame if you were to get paint on either of them. Before you begin your project, purchase plenty of painters tape and use it generously throughout your entire bathroom. Any place that drop cloths cannot cover, apply painters tape. It is always better to be safe than sorry.